It’s no surprise that I’m just a little bit excited to get out of this marina, because that means it’s time to leave for our backpacking trip through South America, and more importantly a stop home to see family and friends! Our bags are mostly packed, and through the art of rolling everything up and then sliding it into a Ziploc bag where then every ounce of air is squeezed out, I was able to pack what I think will get me through six weeks in some very different climates. We still have to live on the boat through the rest of the night, but on our way out tomorrow morning, all the cushions will be flipped up to allow for ventilation while we’re gone. There will be a few other things to take care of as well, but right now it’s mostly just packing and cleaning. The biggest project for the past few days? Emptying out the chill box. We decided that we didn’t want to leave it running during our absence, so now we must try and consume as much of what’s in there as possible. For about four days in a row now, our afternoon snack has been cheese and crackers since we still had two blocks that we picked up in Cayman. Once we realized we couldn’t eat everything still in there, we moved on to favorites, or things that sounded good and we needed to use them anyway. Like the Amish apple butter we picked up way back in St. Augustine and I only wanted to use it on special occasions. Which, when you’re living on a boat, could be anything or nothing, so I don’t know why I keep waiting so long to use it. Last nights dinner, and tonight’s most likely as well, homemade pancakes topped with apple butter and a side of eggs. All the things we can’t finish in time (including my remaining apple butter 🙁 ) will be handed off to Luki since it’s better for someone else to have them than to see them go to waste. Also on our list of things to do before departing tomorrow was to drop Georgie off at here babysitters. Just around the corner from us is a young guy named Jonas, from Germany, who used to work at the marina here. 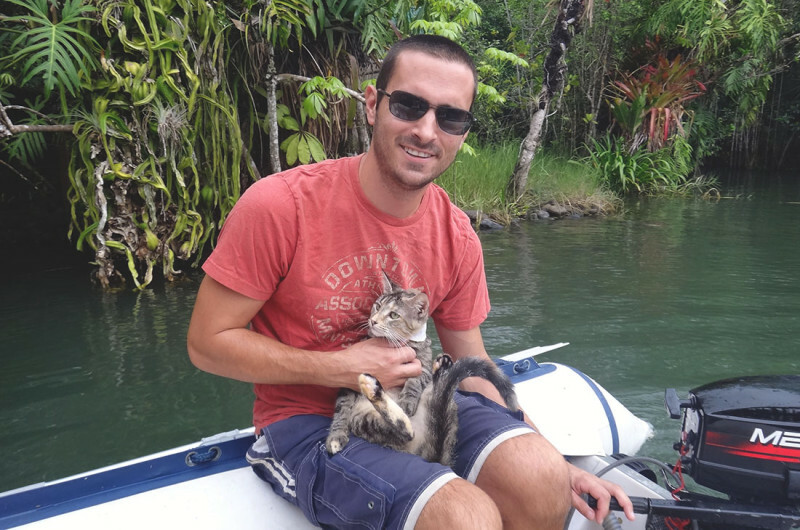 Him and his roommate, Rum, are working on fixing up their own boat to go cruising in a few years, and in the meantime they’re living in a little bungalow here in the Rio with their two cats. 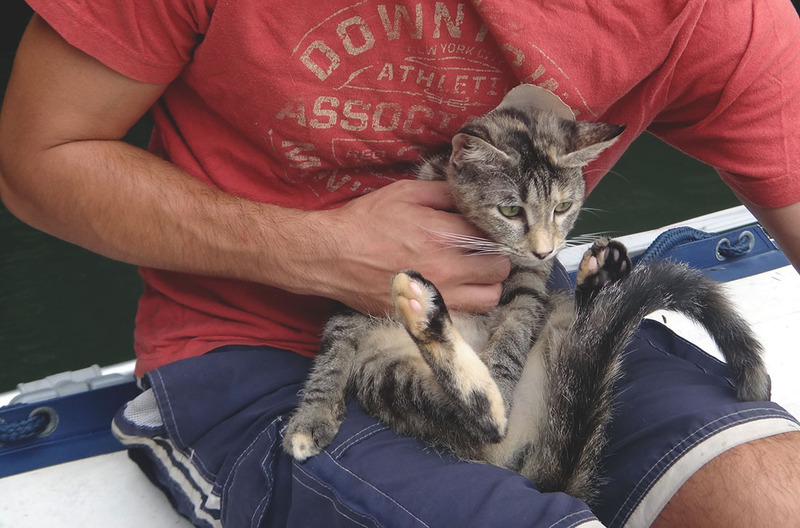 After being totally conflicted about what we might do with her during our vacancy, and even putting out a cat sitting request on the morning net, we got lots of responses from people here at the marina that we should ask Jonas. So, after a conversation one night of “Hi, I don’t really know you that well, but people keep telling me that you might be able to watch my cat….”, we had a cat sitter in place for as long as we needed. All that was left to do, was to bring her there with some food and belongings. 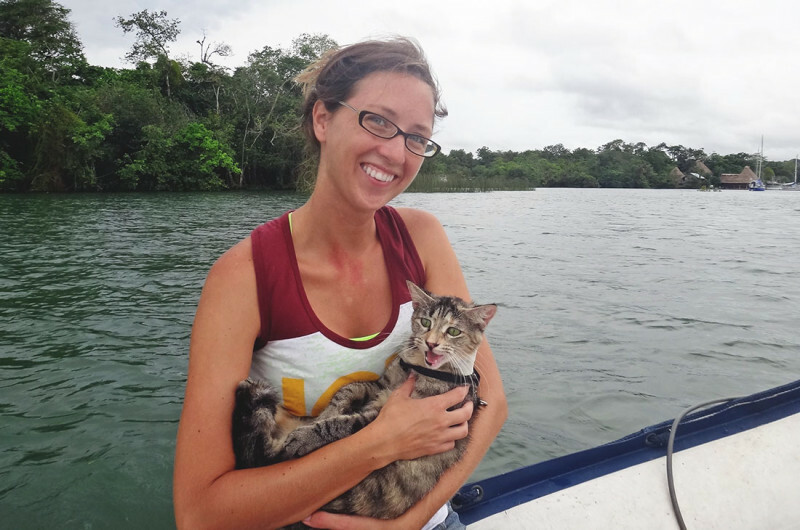 After having dumped Georgie on him already when we thought we were going to Honduras, we found out she’s not the biggest fan of dinghy rides. If we’re still close enough to land or even another boat, she’ll try and jump out. Once we’re far enough out in the water we can let her down and roam the dinghy, fairly certain she won’t try and go overboard. At least we know by now that she can swim. What she will do though, is let out pathetic meows until they go unanswered and will then turn them into weird growly moans. I have no idea how to even describe the sound, but it’s nothing cat-like, I can assure you. 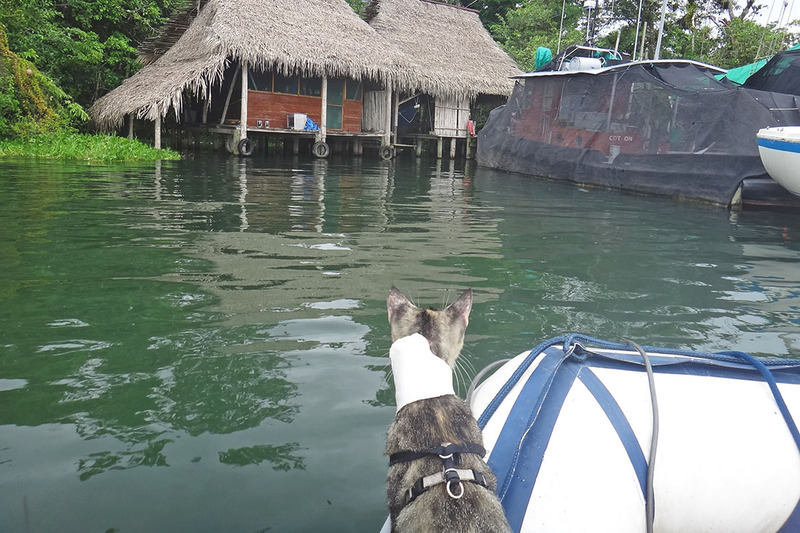 Luckily the dinghy ride was short and the pathetic noises gave way to curious stares as we turned into Jonas’ bay. I’m pretty sure she recognized this place right away as ‘that spot I’m allowed to roam free and I don’t get in trouble for pooping in someone’s lancha’. Yeah, she did that to Luis yesterday. Fun, right? As soon as Georgie was loaded off the dinghy she was busy running around like she owned the place. Hopping on boats with disregard and scaring away the other two cats if they came near her. We’re at least comforted in knowing that if there’s a cat fight while we’re away, ours will be the one left standing. With tons of snuggles and kisses, we said good-bye to Georgie for the next six weeks. So that’s about it. Seacocks will be closed in the morning, all systems will be shut off except for the water maker, and all ports will be closed except for the forward hatch. 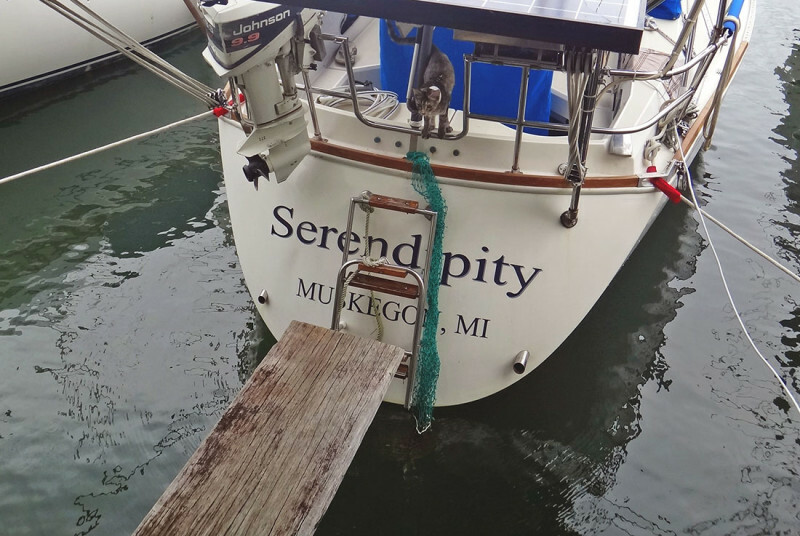 Luki will be keeping an eye on Serendipity while we’re away to make sure she doesn’t sink, and we’ll be keeping our fingers crossed that we don’t come back to any issues like a faulty bilge and a flooded cabin. Time to get busy with some last minute cleaning and making sure that every electronic device, matching charger, and most importantly, passports get packed away. Next time you hear from us, we’ll be Stateside again! Kim, it was such a great time, I can’t wait to get it all down on paper! (Or computer) We really did luck out with Georgie, we were almost thinking of shipping her back to the states to be watched by family while we were gone.